SPRITAM may not be for everyone. Ask your healthcare provider if SPRITAM is right for you. Antiepileptic drugs, including SPRITAM, may cause suicidal thoughts or actions in a very small number of people, about one in 500. Call your healthcare provider right away if you have new or worsening symptoms of depression, any unusual changes in mood or behavior, or suicidal thoughts, behavior, or thoughts about self harm that you have never had before or may be worse than before. SPRITAM may cause extreme sleepiness, tiredness, and weakness, and problems with muscle coordination. You should not drive, operate machinery or do other dangerous activities until you know how SPRITAM affects you. Serious skin rashes can happen after you start taking SPRITAM. There is no way to tell if a mild rash will become a serious reaction. Call your healthcare provider right away if you get a rash while taking SPRITAM. Do not stop taking SPRITAM unless instructed by your healthcare provider. Stopping a seizure medication suddenly can cause you to have seizures more often or seizures that will not stop, a very serious problem. If you become pregnant or intend to become pregnant, contact your healthcare provider right away. In clinical trials, the most common side effects seen in people who take SPRITAM include sleepiness, weakness, dizziness, and infection. In addition to those previously listed, the most common side effects seen in children who take SPRITAM include tiredness, acting aggressive, nasal congestion, decreased appetite, and irritability. Talk to your healthcare provider about other possible side effects with SPRITAM. You are encouraged to report negative side effects of prescription drugs to the FDA. Visit www.fda.gov/medwatch or call 1-800-FDA-1088. For additional safety information, please refer to U.S. Full Prescribing Information and Medication Guide. This information does not take the place of talking with your healthcare provider about your condition or your treatment. Aprecia Pharmaceuticals today announced that SPRITAM® (levetiracetam) tablets, for oral suspension, is now available as an adjunctive therapy in the treatment of partial onset seizures, myoclonic seizures and primary generalized tonic-clonic seizures. SPRITAM is the first prescription drug product approved by the U.S. Food and Drug Administration (FDA) that is manufactured using 3D printing technology. This innovative product disintegrates in the mouth with a sip of liquid and offers a new option for patients, including those who may struggle to take their medicine. 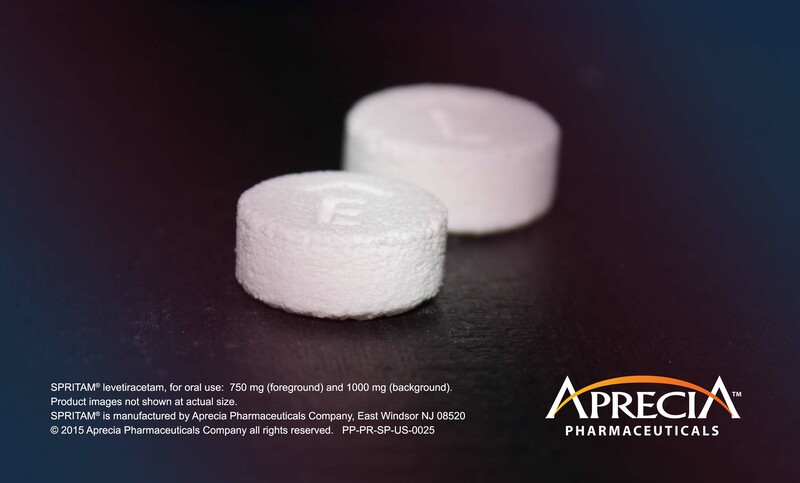 SPRITAM is formulated with Aprecia’s proprietary ZipDose® Technology, which combines the precision of 3D printing and formulation science to produce rapidly disintegrating formulations of medications. Manufactured in a regulated commercial-scale facility, SPRITAM is available in four unit-dose strengths, including 250 mg, 500 mg, 750 mg and 1,000 mg.
For more information, visit www.SPRITAM.com. SPRITAM (levetiracetam) is a prescription medicine taken by mouth that is used with other medicines to treat partial onset seizures in people 4 years of age and older with epilepsy, myoclonic seizures in people 12 years of age and older with juvenile myoclonic epilepsy, and primary generalized tonic-clonic seizures in people 6 years of age and older with certain types of generalized epilepsy. SPRITAM is recommended for use in people weighing 20 kg (44 lbs) or more. ZipDose Technology combines formulation science with the unique manufacturing capabilities of three-dimensional (3D) printing. Aprecia developed its ZipDose Technology platform using the 3D printing technology that originated at Massachusetts Institute of Technology (M.I.T.). Using 3D printing as a catalyst, Aprecia produces and develops formulations of medicines that rapidly disintegrate with a sip of liquid, even at high dose loads. The company manufactures them on Aprecia’s proprietary equipment. 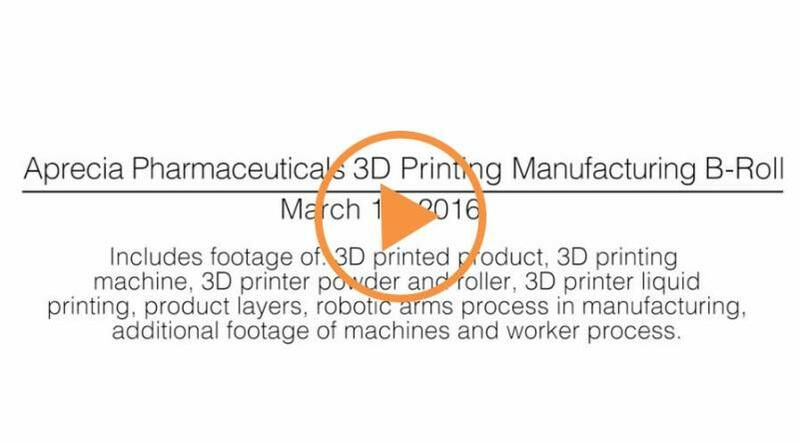 Aprecia holds an exclusive, worldwide license for pharmaceutical applications of this 3D printing technology. Aprecia is an emerging pharmaceutical company that uses proprietary ZipDose Technology to transform the way people take medicine. 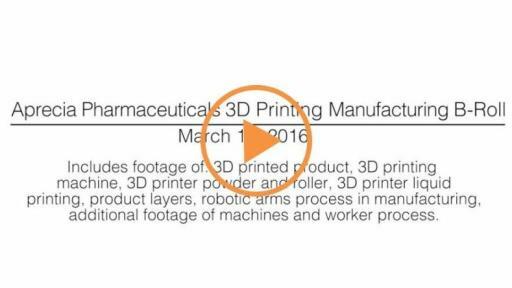 Aprecia is the first and only company in the world to utilize 3D printing technology to develop and manufacture pharmaceutical products at commercial scale. Aprecia plans to introduce multiple products utilizing ZipDose Technology in the coming years, focusing first on the central nervous system therapeutic area, where there is a need for medicines that are easy to take. The company is privately owned, with Prasco Laboratories and its parent company, Scion Companies, holding controlling interest. For more information visit www.aprecia.com. CDC. Epilepsy Fast Facts. Available: http://www.cdc.gov/epilepsy/basics/fast-facts.htm Accessed February 2016. Epilepsy Foundation. What is Epilepsy? Available: http://www.epilepsy.com/learn/epilepsy-101/what-epilepsy. Accessed February 2016. Harris Interactive Inc. Pill-Swallowing Problems in America: A National Survey of Adults. New York, NY: Harris Interactive Inc. for Schwarz Pharma; 2003. Hermes Pharma. Market study reveals difficulties swallowing tablets wide-spread and opens up new revenue opportunities. Press release, September 2, 2014. OTC Bulletin. “Hermes Highlights Need for Better Formats.” 8; July 25, 2014. Cramer JA, Glassman M, Rienzi V. The relationship between poor medication compliance and seizures. Epilepsy Behav. 2002;3(4):338-342.